OK... It doesn't seem like it would be that difficult but I've never done anything like this before. The workshop manual doesn't seem to address it anywher I could find. Is it a simple swap? Is there anything special I need to do or just unbolt one and put on the other? Anything to dress the gasket? Take off the muffler. One clamp and a bunch of bolts. Take off the four nuts holding the converter to the crossover. They will probably break but you don't care. Assembly is the reverse of the above. Worst part, if you have to deal with it, is the heat shield. I have a new heat sheild to so I guess it's a perfect opportunity to kill two birds. Nope - in Oregon it must be made before 1975 to not have to be tested. It does qualify for specialty plates as it's 30 years old but you are limited on driving. I get confilcting info on whether or not it has to pass emissions for these plates and I haven't gone to the DMV to try yet. Besides, the gas fumes are really strong. While I know this won't entirely fix taht, I'm hoping it's a start. Your DeLorean may not need a converter if your local emission control accepts your vehicle as a classic. AFAIK it's still a federal offense EVERYWHERE for a commercial shop to remove and not replace catalytic converter regardless of age/classic etc. Might want to check on that. In general if you remove it yourself you won't get caught as long as you don't live in California or other perpetual emission testing states, but that does not make it legal. changing the cat was the worse job on my car, the studs sheared so i now have nuts and bolts holding it, there is so little room to get a wrench in its such a nightmare. Trailer the vehicle from the facility and the customer must sign a waiver stating the vehicle is intended for off road track use only. In New Jersey if it is not registered as a collector or historic vehicle it is subject to emissions testing which includes a visual inspection for the Cat. As I understand the law it is illegal to modify, tamper or render inoperative ANY emission control device. Federal law enforced by each State. Similar to messing with the odometer. Some are more strict than others. Also consider someday the car may be sold and it may wind up in a State where they are more strict about this than the one you are currently in. Or you may move to a strict State. Similar situation if you modify or tamper with any of the safety features of the car. Most shops will abide by the law, others are more willing to do what the owner wants. In the end it is the owner's responsibility. The good news is the older the car the less strict most States are. 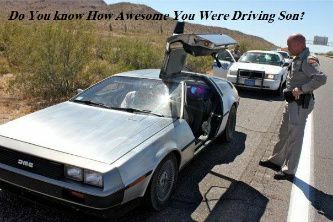 A Delorean in good running tune can run well with ALL of the emissions equipment operating. The best measure of that is keeping track of your gas mileage. If you are in the mid 20's MPG or higher you are doing OK. When I replaced my system, the Cat didn't want to come out so easily. Even after snapping all four studs, the Cat did not separate from the cross-over pipe. I ended up having to take a hammer and pound on it for a good 15-20 minutes. Fortunately the exhaust system isn't fragile and you aren't saving the old Cat, so you can hammer on it pretty hard. Once the rust broke loose, the Cat comes right out and you can put the new one in its place!